With both fiction and nonfiction fascinating movies released this year there are few Based on true story kind of movies too that triggered this year. 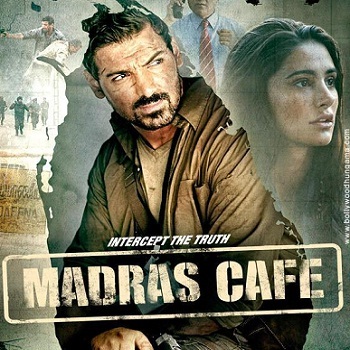 One such based on true story movie released after The Attacks of 26/11,Bhag Milkha Bhag is Madras Cafe. The series of events occurred in Indian political history during 80's and 90's relating to Civic war in Sri Lanka and assassination of Rajiv Gandhi are structured in the form of complete frame of storytelling process. Bound to political flavors, movie maker Shoojit Sircar amplified the engrossing effect on the audience. John Abraham is seen as the Valorous soldier Vikram Singh. The Rock Stat Debut lady Nargis Fakhri is portrayed as the role of British Journalist Jaya Sahini. With fall down and failures in recent years, John Abraham bounced back as Actor through composed hush-up acting. Director Sircar rightly chose the role of Nargis as a journalist to visualize the British looks and Indian accent. Kamaljeet Negi's exquisite cinematography is icing on the cake to the well made connected story. Shantanu Moitra's music is melodious and pleasing too. The vibrating visionary treat and enwrapping screenplay makes the movie more interesting. Recommended to watch to relish and refresh from non radical movies. A powerful and strong movie in Bollywood after a long time.